Sunday Funday at Brennan’s. 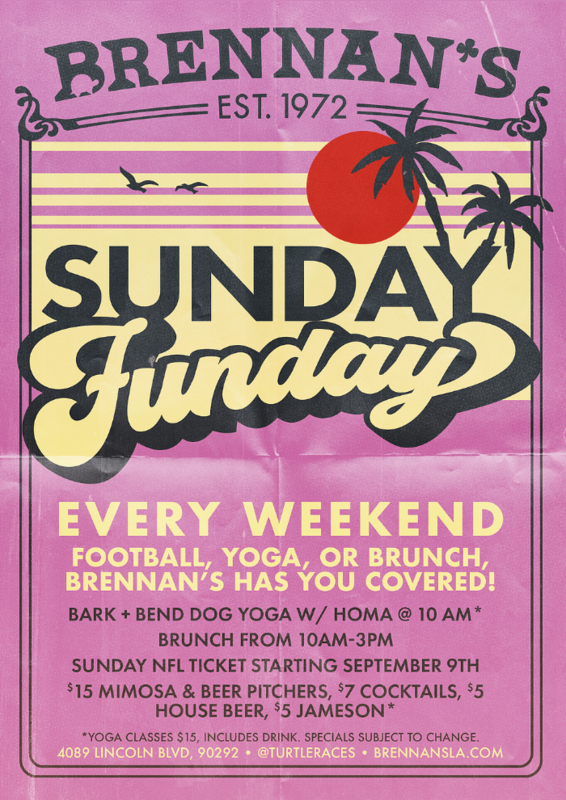 Football, yoga or brunch! $15 Mimosas and beer pitchers, $5 House beer, $7 cocktails, & $5 Jameson. Bark and Bend Yoga every Sunday at 10 a.m.
$1 sangria and mimosas every Sat. and Sun. Sat. and Sun. Brunch, 10 a.m.-3 p.m. Enjoy lawn games, chess, pool table, badminton, scrabble and more! 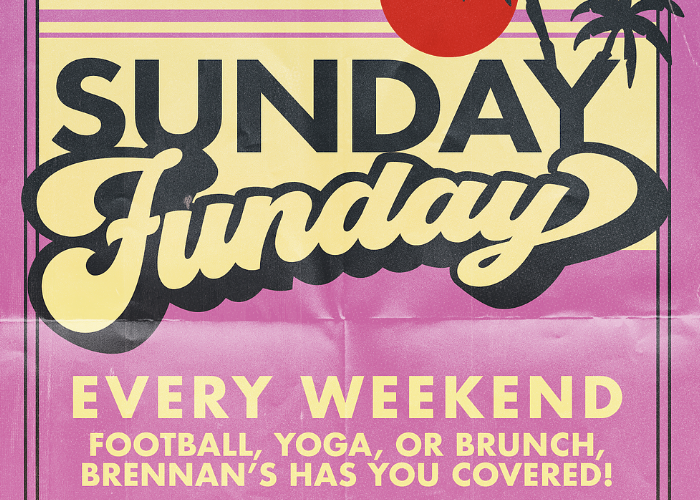 View all the other fun things happening at Brennan’s! The newly revamped Brennan’s combines a mix of new school and old school through our classic American Pub Fare, 16 rotating taps of craft beer, creative cocktails and quirky vintage decor, some of which dates back to 1972! Our fun, laid-back environment combined with our outdoor sports court, games, and dog friendly patio, make for the perfect stomping grounds for locals, visitors and everything in between. Happy Hour is M-F from 3:30 p.m. – 7:00 p.m.
Brennan’s is open for lunch daily! Turtle Races every first and third Thursday each month @ 9pm. Friday Pie Day! Come enjoy live acoustic music and complimentary cheese and pepperoni pizza on our patio every Fridays from 4-7pm. Case of the Mondays. Monday Night Football featuring $15 pitchers, $5 House beer, $7 cocktails, & $5 Jameson. And if you ride your bike or bird to Brennan’s, you get a beer for a penny! Wow! Take out Monday Frustrations in Sunset Bootcamp w/Homa @ 7 pm.